On September 15, project directors Mark Souther and Meshack Owino introduced “Curating Kisumu: Adapting Mobile Humanities Interpretation in East Africa” to National Endowment for the Humanities (NEH) staff and grantees as well as representatives of a number of government agencies, universities, and humanities institutions at the NEH Office of Digital Humanities (ODH) Project Directors Meeting. As recipients of one of 20 new NEH ODH start-up grants, Souther and Owino participated in a “lightning round” of three-minute, three-slide presentations. 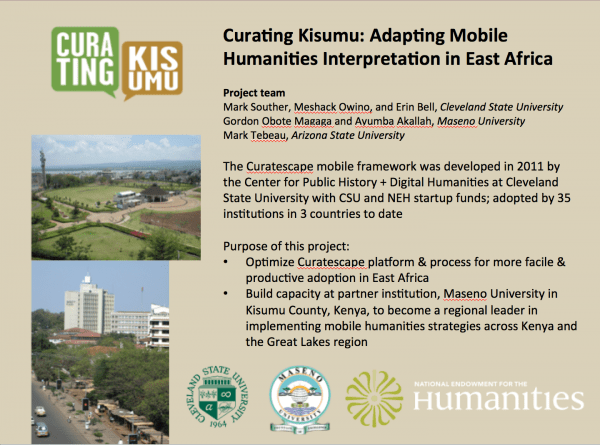 “Curating Kisumu” is a collaboration between CPHDH and Department of History and Archaeology chair Gordon Obote Magaga and his colleagues at Maseno University to explore how to extend the Curatescape mobile framework to East Africa, starting in the western Kenyan city of Kisumu. Led by Souther and Owino, the project team also includes CPHDH technology director Erin Bell, Gordon Obote Magaga and Ayumba Akallah (Maseno University) and Curatescape co-founder Mark Tebeau (Arizona State University). Project advisors include Gregory Maddox (Texas Southern University), Angel David Nieves (Hamilton College), Agnes Odinga (Minnesota State University, Mankato), and Tom Scheinfeldt (University of Connecticut). Created in 2011 at CSU, Curatescape is a low-cost, open-source solution for curating place-based humanities content that has since been adopted by a growing number of institutions (35 to date) in the United States, United Kingdom, and Australia. Curatescape, which comprises themes and plug-ins built atop the Omeka content management system, grew out of our pilot app project, Cleveland Historical, whose sites are curated by students, faculty, teachers, and community members. Curatescape supports text, images, audio, and video to create a richly layered, geolocated depiction of places, people, and events. More than a platform, Curatescape is a set of best practices honed through years of collaborative work that began with collaborative work launched in the Center. Maseno University is a rising star in higher education in East Africa and has assumed a leading role in information technology innovation among the region’s universities. Kenya is a logical home for introducing Curatescape in the Great Lakes region of East Africa, and Maseno’s faculty bring important content expertise and leadership to the endeavor. Our project seeks to make Maseno University a regional hub for adapting and expanding Curatescape in East Africa, beginning in Kisumu. With faculty and students on both sides of the Atlantic, we will curate a mobile-responsive Curatescape website as a first step toward adapting the app itself. Maseno University has dubbed the app MaCleKi, an acronym that highlights what we hope will be an enduring partnership between our institutions to create a model project in Kisumu. In our funded start-up phase, now underway, we will work together to curate a series of initial digital stories about Kenya’s third-largest city while studying how people use their mobile devices, the constraints they face, the expectations they bring to apps, adaptations that may be necessary to place the richest possible layering of curated humanities media to the largest contingent of users, and the financial and human capital needed to build a project that is scalable across Kenya and ultimately to other points in East Africa. Beyond curating Kisumu itself, the team will seek opportunities to embed the humanities more firmly in the public arena in East Africa by providing a first-order source of educational digital content and encouraging Maseno University’s continuing expansion of capacity to partner with other regional organizations. The project has a number of inherent challenges, and grappling with these is a priority in the start-up phase. Most Kenyans now use mobile phones, but most do not have the same level of internet access that most Americans enjoy. Smartphones are still in the early stage of gaining wide usage, which necessitates rethinking content provision for feature phone users. Kenyans are enthusiastic adopters of mobile devices but use them somewhat differently than in the U.S. Beyond technical challenges, it is more difficult to create content in very large university classes. Furthermore, it is common for even core faculty to teach at multiple campuses (often many miles apart). Thus, it will take considerable effort and creative problem-solving to sustain such a project. We look forward to learning more about how to adapt Curatescape so that an implementation grant can support Maseno’s extension of its app to Kenya, which can provide a model for other nearby countries. Souther and Owino will travel to Maseno University in January 2015 for an intensive week-long series of planning meetings and training sessions that will involve the project team and Maseno administrators, faculty, and students in conceptualizing project themes, content, and narrative strategies, discussing mobile use habits, technical challenges, and possible solutions, training in Omeka + Curatescape, course project planning, and preparations for next steps. In spring 2015 Owino and Magaga will collaboratively build the first app sites with students in their respective courses. Thereafter, the project team will return to Kenya to revisit the first stage of the project and plan for the next semester’s continuation of content building. Throughout 2015, we will offer periodic updates on our progress.